Like the Memory Urn, the Memory Box offers identical exterior styling, including a Rosewood veneer with birch interior. Elegantly embellished with a brass lock assembly (including two antique-looking, tasseled keys), the Memory Box is finished with seven coats of polyurethane for a brilliant sheen. 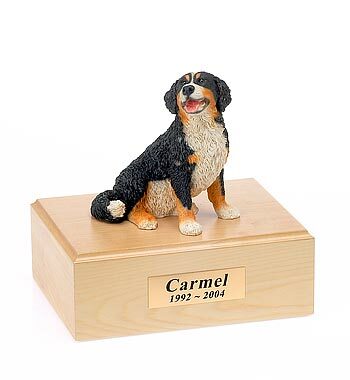 In addition to holding your pet’s cremains, the Memory Box pet urn also provides a tray for photos, plus an open compartment designed to store your pet's collar, leash, toys or other remembrances. This classic resting place for your friend is well appointed in every way. Available in two sizes for pets up to 150 lbs. If you desire, your Memory Urn can be personalized with a solid brass nameplate, including an inscription of your choosing at no additional cost. The inscription may be one to four lines in length. Visit the Personalization page to view sample nameplates and inscriptions. 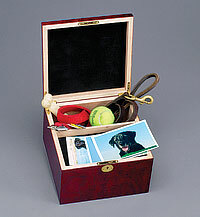 Your pet's bagged cremains are placed in the Memory Box pet urn under a removable access cover. The access cover, lined with black felt, is held in place with four screws. When screwed in place, the cover provides a shelf for photos. Black felt covers the top and bottom inside panels and the exterior bottom. I am so very pleased with the memory box. It suited my needs very well and have made such a beautiful and special place for ""my Trix"". I will not hesitate to recommend Angelashes. Thank you so much for the prompt reponse to my recent order for a keepsake box for our beloved cat. I am so pleased with the quality of the box! Bennie was an absolutely awesome cat, 18 years old when we had to put him to sleep, so this beautiful box pleases me immensely as a final resting place for our loyal friend. I'll be sure to recommend you to my friends, and to order from you again myself when our other two ""fur children"" need your services.